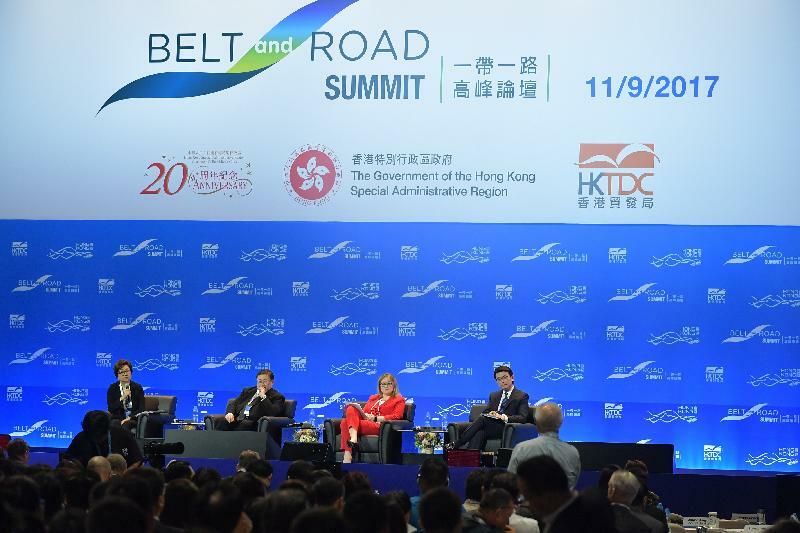 You have heard in the opening session the latest policy direction from the perspective of the Central Government of China on the Belt and Road Initiative. Let me highlight two points which I think are worth repeating. The first one is: the Belt and Road clearly is not just a China's initiative as also echoed by the two ministers present in this session. It is simply too big for just one single party as evident from the dollar sign that you have heard. But more important, I think, is the Belt and Road could not make a success without the realisation of the collective benefits to be gained by all those participating. The second point about the Belt and Road: it is not just a trade and investment initiative. It is also very clear that you have heard this morning that the message of "Five Connects" came out repeatedly, namely policy co-ordination, which obviously involves government-to-government (G-to-G) or among different jurisdictions; facilities connectivity is all about infrastructural development, and we have heard of projects crossing boundaries or between regions or even trans-continents; unimpeded trade and financial integration is core to all these investments and finances; and last but not least is the people-to-people bond which I see as a sustainable development between not just countries but also people. The Belt and Road Initiative encompasses the vision that through facilities upgrading, capacity building and closer economic ties with mutual trust, we could bring about a better livelihood among all parties involved. So how to build this partnership and also, closer to home, one would ask what has it to do with me? This is a question that is often asked even within tiny Hong Kong which is so close to the Mainland. I believe all the participants today answer that question by your presence. But I believe a fuller answer to the above question among different sectors may also give us a wider perspective on what it has to do with us here in Hong Kong or as international businessmen. I'll pick a few sectors to start with. I will start with the infrastructural investors. For infrastructural project initiators, including building and construction conglomerates, I think they see the Belt and Road as the high sea where they can set sail for a catch of vast investment and project opportunities that are in need of engineering solutions. The obvious examples are construction contracts, including those being mentioned, railways, ports, highways, airports, refineries, power plants, etc. I can tell you on the way I came in, I collected over two dozen name cards, including companies which have invested or tried to invest in these projects. And they all mentioned that they do not do it alone. So, even these big corps would not go out in a single sail as the high sea sometimes is too big or at times too rough for them individually. Their catch would hinge on how much they know about the market, the culture, the local practices, which fall on the expert areas of some professional services which could help guide the sail if they are to avoid hitting an iceberg or run aground on shallow reefs. Today, I understand that TDC (Hong Kong Trade Development Council) has lined up 175 projects that are seeking business partners amongst investors, financiers, risk assessors, insurers, architects and engineers, with whom they wish to set sail together. So these are people who know China, who know Hong Kong and the wider world. And even if they do not know exactly where and what, I think the typical Hong Kong partner would try to find out and find the expertise that you can partner with. For professional services like financiers, bankers and lawyers, I think the Belt and Road offers huge opportunities given rise by these projects, including project financing, syndicated loans, bonds issuing and venture capital. For lawyers, legal services from contract preparation to patents or intellectual property rights protection. Recently, a lot of lawyers told me that the best vehicle is to have the projects put in a project investment vehicle so that they can be protected by Hong Kong law and serviced by Hong Kong professional services. Also that involves dispute settlement, provisions and also future mediation and arbitration services if they are really needed. We also need bankers, accountants, auditors, insurers, just to name a few. No wonder you will find one maybe sitting next to you - a lot of people who turn out at this forum are included in the above professional services today. They are your guiding partners, especially in your business ventures into territories that are far from home and also in jurisdictions that might not be entirely familiar to you at the moment. One would also ask for the small and young, are you being left out? People in various trades and industries often ask if the Belt and Road caters only for the big shots, and it makes one wonder whether SMEs (small and medium enterprises), particularly nowadays what we call micro-SMEs, could even get close to the major deals. This is a very pertinent question that Hong Kong would have to address. Had the Belt and Road been confined to the Global 100s or Fortune 500s, Hong Kong would not have been the market place. Hong Kong prides ourselves as being the best market place for both the big and the small, MNCs (multinational corporations) as well as start-ups. If you go to visit the TDC's portal, there are examples and actual experience sharing on small professional firms that could secure contracts not only because of their size but rather their skills, such as professional experience, flexibility, ideas, design, ingenuity and first-hand and unique knowledge of the markets of both the East and West. 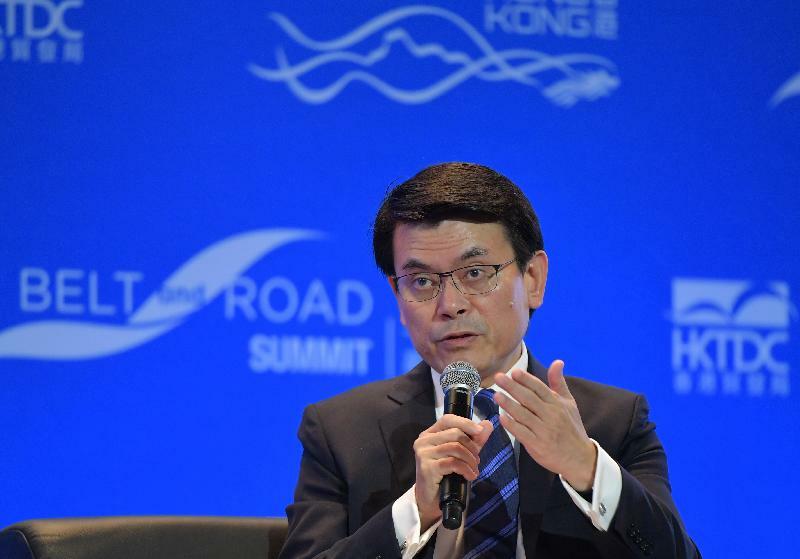 Now, I need not answer the question of why Hong Kong, because that is fully covered in the Chief Executive's speech. But perhaps you would say that all the above are good but not good enough, because to bridge the valleys and to avoid potholes that are inevitably found in overseas and cross-boundary ventures one would find comfort with a government-facilitated gateway aided by navigation practices that are transparent, accessible and reliable. Here, I would like to highlight four points that Hong Kong is offering. The first is what I call China-Hong Kong Connect. To give the business community a better grasp of the initiative, we are entering into an agreement with the Central Government, which the Chief Executive mentioned. In fact, it was an idea that, when we visited Beijing in late July, we have proposed an agreement with the National Development and Reform Commission (NDRC) and hope to have it signed before the end of the year. This agreement would give a very detailed description of areas that Hong Kong is good at, and areas that we believe that Hong Kong can serve the Belt and Road Initiative not just for the country, but also for partners that will be collaborating with the Mainland. The second point is as we proceed to sign this agreement, we are also establishing, as the NDRC Vice-Chairman mentioned, a bilateral government-to-government mechanism where the Hong Kong Government, with co-ordination by my bureau, i.e. the Commerce and Economic Development Bureau, will be putting together direct and regular meetings with the NDRC, Ministry of Commerce and Ministry of Foreign Affairs to discuss matters pertaining to the Belt and Road. We will also at the same time make use of our Economic and Trade Offices established in the Mainland to engage provinces and cities that are involved in the Belt and Road. Such information through the G-to-G dialogue will of course be passed on to the trade and professional community back home. The third point is the Multilateral Trade Connect. Certainty of trade and protection of investment are important, and this is done through the signing of free trade agreements (FTAs), investment promotion and protection agreements and the comprehensive agreements of the avoidance of double taxation. These are bilateral agreements that Hong Kong has been entering with other countries and economies. I can assure you that in the ongoing negotiations, we will give priority to countries along the Belt and Road. The recent conclusion of the FTA with ASEAN (Association of Southeast Asian Nations) is the latest example that you can see. Last but not least is the Business Connect. The Summit today, which I believe will become an annual business forum that augments the high-level Belt and Road Summit to be held in Beijing biannually, will be the business forum for both G-to-B (government-to-business) and B-to-B (business-to-business) connections. We are also stepping up consultation and collaboration with the local and international community. The Government will use our own advisory committees, both the revamped Trade and Industry Advisory Board and the International Business Committee which include all the local and foreign chambers of commerce, to engage them, together with professional groups, think tanks and young start-ups to hear their views and keep them abreast of the latest developments. At the business front, the TDC, our partner, will be doing market research, country and regional profiles and analyses, trade intelligence gathering and business matching. One must not forget the trade missions and roadshows that we will continue to launch in countries along the Belt and Road. I am also happy to hear that there will shortly be the setting up of the Belt and Road Chamber of Commerce, a business connect initiative taken by some key business leaders in this direction. Following that, I also notice that some professional bodies, the legal sector included, are also pushing forward alliances with their overseas partners along the Belt and Road countries. Together, we are seeing a very clear vision and also an affirmative action list on the Belt and Road. It is indeed an alliance in the making among countries and people mutually engaged with trust, support and accomplishment. So the Belt and Road is set to connect businesses, governments and people through a shared vision, a vision that will bring betterment to all who participate and stand to gain. Perhaps I will pause here. I am happy to join the discussion and also answer your questions. Thank you.